​Being a national leader in our faith for the past eighteen years led me to pursue a career in Environmental policy and administration, and an Masters of Business Administration with a focus in nonprofit management prior to entering the ministry. Well-managed organizations are better able to live out their missions and make a difference in the world. As a leader, I seek to support administrative staff and volunteers while ensuring sound management of congregational resources, healthy and effective communication throughout congregational life, and clear and appropriate governance structures. Churches, like any organizations, have their own unique cultures, practices, characters, strengths, and weaknesses. As both a systems-thinker and a minister, I lead organizational development work with attention to big picture dynamics playing out in current situations, and possibilities for institutional spiritual growth as lay leaders and staff navigate challenges together. Important goals for congregational organizational development are to increase in health and strength while embodying our mission, our values, and our theology, as effectively as possible. This sometimes looks like an increase in formal structure, and sometimes looks like the removal of bureaucratic hurdles. It means fixing problems at their root causes and supporting leadership development at every level of the organization. It means ensuring clarity of roles, responsibilities, areas of authority, and accountability structures for all staff and lay leadership and constant education throughout the congregation about covenant, right relationship, healthy communication, and appropriate boundaries. 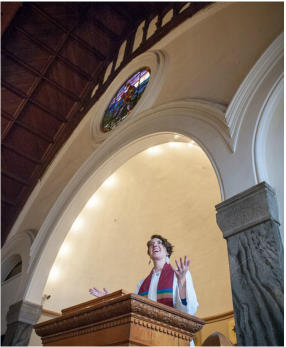 It means all of this is done to serve the congregation’s mission, to support congregant’s spiritual growth, and to move towards greater justice within and outside our walls. ​I am a firm believer that a minister, particularly a solo, senior, or lead minister (or another minister with significant administrative or executive responsibilities) should be integrally involved with a congregation’s financial stewardship efforts. Ministers have four main gifts to offer congregational stewardship. The first is their ability to bring spiritual depth to fundraising. Rather than using primary messages of guilt, duty, or even competitiveness, stewardship efforts can speak to the congregation’s values, mission, its sense of loving community, and possibility. Giving is part of living a life of integrity and ethics, and helping congregants discern how giving plays out in their values systems, while supporting their healing from shame and stigma related to finances, is an important spiritual leadership task for a minister. Second, as ministers are the primary communicators in congregational life, they have an important role to play in integrating a cohesive stewardship communications strategy with the community building events that are part of most campaigns, and the worship life of the church. Third, ministers help the congregation hold a holistic view of stewardship as part of the full ministries of a congregation, an opportunity for spiritual deepening and aligning our values with our actions, rather than a distasteful necessity dreaded by every member each year. Fourth, a minister has a 360 degree perspective on congregational life. They see the programmatic and administrative priorities and needs in order to nurture the health and strength of the congregation. With this knowledge, they can help align a stewardship campaign with these priorities and needs so that the congregation can understand and feel ownership over the relationship between their giving and the carrying out of the church’s mission. Stewardship is a particular interest and passion of mine, as someone with a background in management, finance, systems leadership, and fundraising. My MBA in non-profit management and my time spent as Interim Advancement Director at Starr King School for the Ministry formed me as a stewardship leader who approaches organizational financial realities with a spiritual perspective. Most importantly, however, I believe that congregations meet their financial goals when they meet their congregants’ spiritual needs. The best support I can offer to congregational stewardship is to offer the kind of ministry, throughout congregational life, that changes lives and sustains spirits.